There is plenty to think about when starting up a new business venture and one way to have a successful start is by having a business plan. Banks will need one if a loan is going to be applied for. A good business plan defines the company and should be in place. Using a Business Plan Checklist can make this process easier by providing an analysis of the key activities that need to be performed before preparing a formal business plan. The Business Plan Checklist template that is available on this page is free and is downloadable from here. This template is easy-to-use and customizable with a guide explains what is needed to fill in each section. 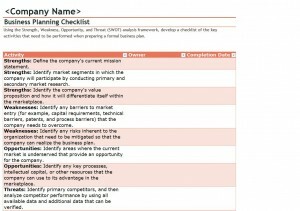 This Business Plan Checklist includes a SWOT (Strengths, Weaknesses, Opportunities and Threats) analysis. First, enter the Company Name on the top of the document. Second, identify the company’s Strengths such as the market segments, how it will outshine its competitors. Third, identify the company’s Weaknesses; any barriers and possible risks that may affect patents, processing, capital, etc. Fourth, Identify the company’s Opportunities that would be an advantage to coming out on top. Fifth, identify the company’s threats, which is usually the competition or the future of the area. This is a good place to think more about future threats. Sixth, set up a completion date and assign others to participate the completing the necessary activities that need to be performed in order to be better prepared to develop the formal business plan. First, read the suggestions in each activity for ideas in completing each activity of the Business Plan Checklist. Second, the Strengths activity allows for the company’s mission statement. Third, this Business Plan Checklist is the tool that will help establish a professional looking Business Plan in the future, so even though a completion date is set, make sure that all activities are thought through very carefully before completing. Fourth, have others look over the Business Plan Checklist after completion.